My husband just became a US Citizen this past week! We celebrated with friends by having a good old fashioned barbecue – although we had to do it indoors, because we live in a condominium building in Boston. The cake was fantastic! I ordered it from Party Favors Bakery in Brookline, MA. For appetizers I served Lipton Onion Soup mix dip with chips and veggies. The reaction to this dip was amazing! For just about everybody, it sparked memories of childhood which is probably the last time any of us had dip made this way. Fans of startcooking.com will love this one! Mix one envelope of Lipton Onion Soup mix, with 16 ounces of sour cream. That’s it! That’s really ALL there is to it. Too often, in this day of being health and calorie conscious, the luxury of real sour cream is by-passed for fat-free sour cream or yogurt. These substitutes work – just. But they just don’t have the luxurious taste of real sour cream. I do think this Liptons must have a secret recipe with this soup mix because other brands don’t work as well, in my opinion. I have also used this mix to make the fantastic meat loaf recipe on the back of the box, but, funnily enough I have never actually made onion soup from this dried mix – which is what it is supposed to be designed for!. I also served asparagus, carrots and celery sticks with the dip. Much to my amazement all the vegetables got eaten. I really think it was because I blanched them before serving, and it made a huge difference in the taste. To blanch asparagus, wash it, cut off the end, put it in boiling water, with about 1 teaspoon of salt, for about 45 seconds, then, using tongs, put the spears into a bowl of ice water. This stops the cooking and makes them have a beautiful green color. The carrots I peeled, cut into strips and blanched for about 60 seconds. 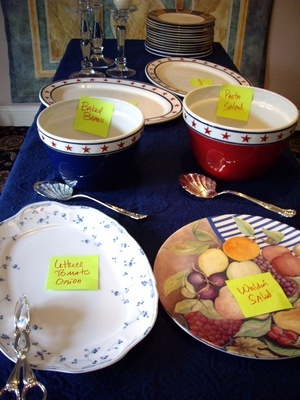 When I am doing a buffet table I always get out all my serving bowls and, with post-it notes, label each dish. This way I know everything fits on the table and I am not scurrying at the last minute trying to find that certain serving dish! 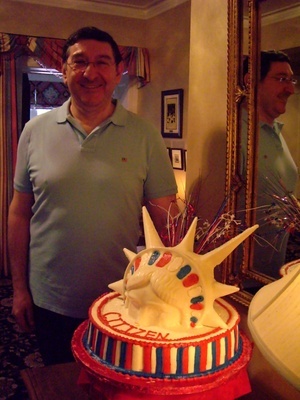 We had a great party celebrating David becoming a US citizen! Which came first, Lipton Onion Soup Mix or “Chip & Dip” dishes? I totally agree! Especially when it comes to ice cream! (I consider Ben & Jerry to be my best friends.) Popsicles are great too because they are fat free to begin with. I read in a textbook for a nutrition course years ago that your digestive system needs the fat in order to absorb calcium into the bloodstream. If that is correct (it was a reliable textbook and I have every reason to believe it, I just have not come across the information elsewhere), then the huge irony of people drinking skim milk and eating low fat dairy products to get their calcium is that, while they are certainly ingesting calcium, they are not absorbing or using it. I worry that the myth of skim milk equals reliable source of dietary calcium means we will start to see a radical upswing in incidents of osteoporosis in the skim milk generation (since it is a relatively recent phenomenon, and you put down most of your bone calcium up to the age of about 35 if I recall correctly). I agree, too, that fat equals flavour. Most low fat prepared foods just have water or even air addedâ€”so you are paying the same amount or even more for less food and less flavor. What kind of an equation is that? And while I am not a popsicle fan, Kathy (I tend not to fare well with cold foods), I agree that eating foods that are naturally fat free makes much more sense than trying to take the fat out of fatty foods. Hmmmâ€¦I dont mind being known as a snob, or a food snob, but I hope this comment doesnt make me a fat snob!! Because I am of vintage years, a veggie or chip dip of Lipton Onion Soup and Sour Cream would be a staple in my kitchen. Did you know that fudgscicles are also fat free and a great treat for all the chocoholics out there. Pat, thanks for the fudgscicle tip! They will definately be added to this weeks grocery list! I used to add canned clam to that same dish with a little bit of Worcheshire and hot sauce to taste. Delicious! Wow Kathy! It really sounds that you had a nice time… I Wish I was there to taste your “Mom’s Gelatin Waldorf Salad”! Actually I`m from Belgium so I don`t really no anything about American Barbeque but I would sure want to taste your`s! P.S. : Kathy, Thanks for all your videos. They are really marvelous! 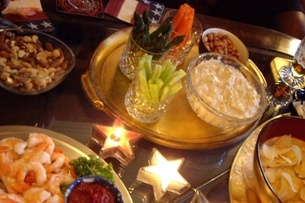 That clam dip that Marla speaks of is awesome too. When I was a kid, they always had clam dip right there with the usual french onion, ranch, etc., but not anymore. I don’t know why, but you can’t find it anywhere. So I made it using the recipe on the side of Snow’s-brand canned minced clams. There’s no onion soup mix involved in their recipe though. I’m going to make that oniony stuff now though too– thanks! Awesome site– the best cooking/recipe site I have found! Thanks Dave! I am delight to hear how much you are enjoying my site and really appreciate all your fabulous tips!